Visit Ngamba island chimpanzee sanctuary in Lake Victoria to see the habituated chimpanzees as they go about their day to day life. 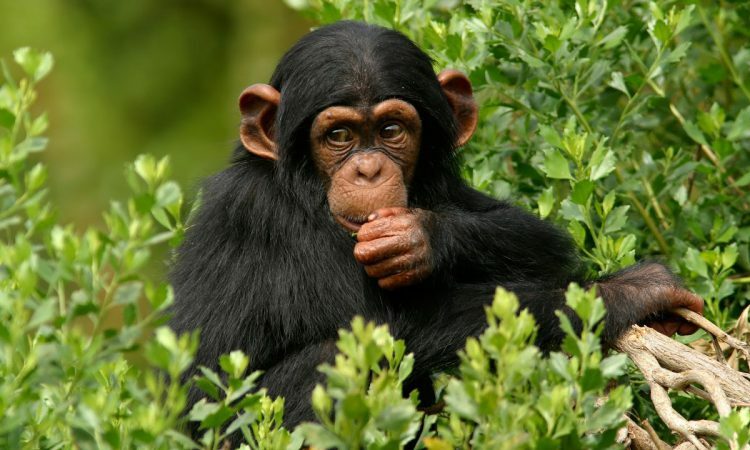 The chimps are rescued from various national parks in case they have been hurt by traps and or other animals and brought into the Ngamba island sanctuary. This safari starts very early in the morning when our guide picks you up from your hotel, after which you are transferred to the shores of lake Victoria where you will board a cruise to take you to Ngamba island a chimpanzees which were previously in the wild, confiscated from illegal wildlife traffickers or rescued from wire snares and other booby traps. The 45 minutes exciting cruise on the blue calm Victoria waters takes you across the Equator line giving you a rare opportunity of being in two world spheres within a space of few minutes. We’ll have lunch and overnight stay at the beautiful white sand beaches at Ngamba Island Camp. The next day starts early, and you will probably be awoken by the hooting of chimpanzees, sweet breezes of Victoria and romantic sounds of waves washing the shoreline. You will then have an early morning breakfast with the best African coffee. Your vaccination documents will be checked and verified by the onsite veterinary department to determine your eligibility for a forest walk. A guided nature walk with resident guide gives firsthand insights about the forest environment. The walk allows see daily behaviors and experiences of the chimps in their daily life. You will have your breakfast at the camp as you reminisce the strong memories of Ngamba Island and its chimpanzees. A speedboat will take you to mainland onto Entebbe International Airport for your out bound flight.